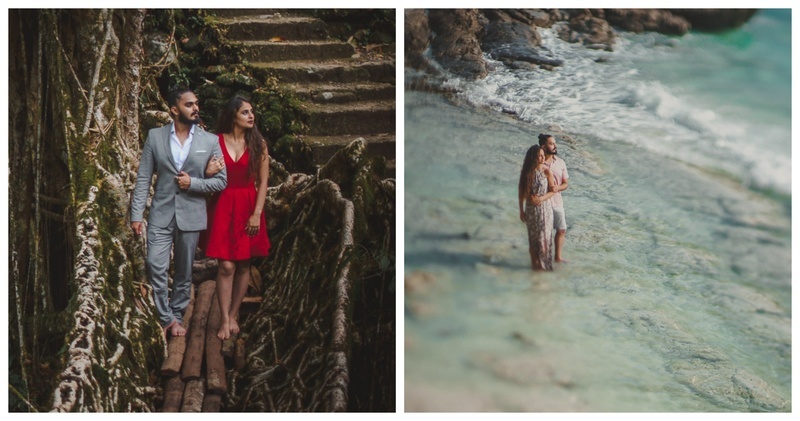 This magical ocean V/S mountain Pre-Wedding Shoot is beyond beautiful! Getting your pre-wedding shoot done at a unique location has reached its zenith for the millenials. More and more couples are looking for newer concepts and places to do their pre-wedding shoot at, a way to say their love story in a never-said-before manner! Exploring new horizons they decided to come together as one, where time stood still to glorify their exquisite story that was created somewhere in between misty waterfall of Meghalaya and the living root bridge. Beautiful isn't it? With the pictures coming to an end, I am sure you are left asking for more.